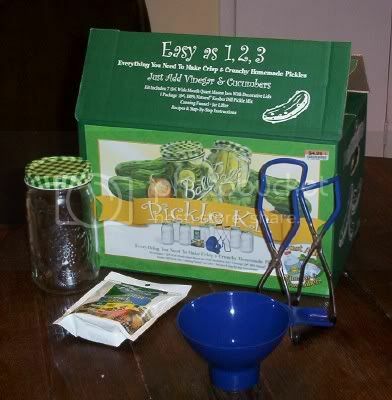 I tried the Ball pickle mix this summer with cucumbers from my garden. I was disapointed with the finished product. Crunchy they are not. I'd look for different pickle recipes. I am detirmined to find something to do with the 6 pints of pickles I now have. I'll try again net year with a different recipe. Do you can at all? Jellies are really easy to make. I have a great recipe for Cranberry Apple Cider jelly that very easy and makes very impressive gifts. I take it to my MIL's for Thanksgiving. It uses comercial cranberry juice and apple cider, pectin, lemon juice and sugar. They also have low sugar pectin so you could make your own spreads that you husband could eat. I made some low sugar strawberry jelly with some berries from a local U-pick farm that was fabulous and only had 3/4 a cup sugar in 3 pints as opposed to 7 cups in 4 pints of regular. I also make and can apple sauce when apples are in season. I make mine sugar free. Anyway sorry for the long comment. I'm mildly obsessed with the canning. I LOVE doing it. Big lots usually has jars pretty cheap in the fall. If you'd like the cranberry apple cider jelly recipe PM me at PH. Kristy, I'm sorry that your pickles weren't delicious. I'll pm you with some canning questions, OK? I'm intrigued by the Cranberry Apple Cider Jelly that is 'very easy to make, and impressive to give.' It sounds amazing! I admit I am usually intimidated by tasks like canning, or making homemade jelly, but you've sold me. Any chance you could post the recipe? Sarah Jane, I've emailed Kristy to ask for directions for her Cranberry Apple Cider Jelly. I'll post a link when she shares it with us, so check back!